Dan Levin has a nice article, "Adidos and Hotwind? 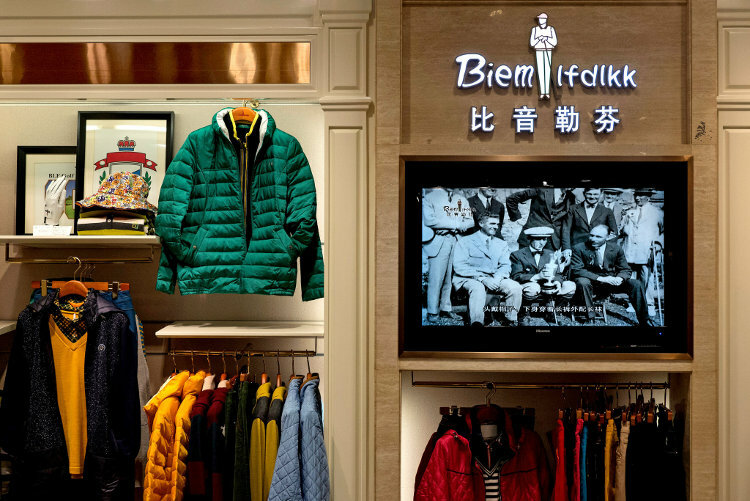 In China, Brands Adopt Names to Project Foreign Flair" (NYT, 12/27/14). This has to be one of the most outlandish pseudo-foreign brand names ever devised in China. For an instant, I reckoned that "Biemlfdlkk" was an attempt to mimic Icelandic, but that wishful thought vanished with the realization that "Biemlfdlkk" defies pronunciation in any language with which I am familiar. Perhaps in an effort to seem slightly more believable or pronounceable, Biemlfdlkk is sometimes divided up this way: BILEM.L.FDLKK. BIEMLFDLKK is a korean famous sport garment brand. Its flagship shop was opened ceremoniously on June18 in Anshan, a north-east middle-class city in China. Don't ask me what the juxtaposition of "assonance / unisonance" and "Leuven / Louvain" might imply. I have no clue whatsoever. Just when I thought that I was finished writing about wretched Biemlfdlkk, I discovered that bǐyīnlèfēn 比音勒芬 also corresponds to another pseudo-foreign brand name, Bienlof, which looks a lot more authentic as a foreignism, though I still have no idea what it means. In any event, it would appear that Biemlfdlkk is an outlandish knockoff of a less gibberish-y knockoff. "lfdlkk" looks like random typing on the second row of the keyboard, apparently by a trained two-handed typist. It vaguely resembles the clothing brand FCUK, but that's probably a coincidence. it really does remind one of the sometimes incredible stuff people make up in the west to make something "look Chinese". this includes what you get to see when you click on "Ausländisch / Chinesisch, Japanisch" (omg) on dafont: http://www.dafont.com/de/theme.php?cat=201, uncounted kanji tatoos gone wrong, and many, many Chinese letterings on advertising where the designers and the people putting things into place had just one job (and ended up with upside-down characters). BIEM.L.FDLKK GARMENT CO., LTD has a trademark application for the name "BIEM LOFEN". The enticing goods and services listed include "Animal skins; purses; travelling bags; vanity cases not fitted; fur-skins; umbrellas; walking sticks; saddlery; saddlery, namely, straps of leather; gut for making sausages". Under "translation of words in mark" we find "The wording 'BIEM LOFEN' has no meaning in a foreign language." This post provides links to posts on ambigrams and other attempts to write English words with Chinese characters or with letters that are made to look like Chinese characters. "Biemlfdlkk" is quite a different kettle of fish. It is a Chinese invented word that consists entirely of unaltered Roman letters. As someone who took a couple of Arabic courses 30 years ago, "fdlkk" immediately suggested to me the phrase "min fadlik", or "please." This may be a stretch, though. "lfdlkk"… vaguely resembles the clothing brand FCUK, but that's probably a coincidence. Haagen-Dasz is a pretty good American example of the same phenomenon. Except that Haagen-Dasz is pronounceable, and most people think that it is Scandinavian of some sort. Reuben Mattus, the man who invented the brand name did that intentionally; he wanted to make it sound Danish. Biemlfdlkk, in contrast, is unpronounceable, and nobody has a clue what language it's supposed to resemble. What if the Latin letters were chosen for their shape/resemblance to Chinese characters? 1. 'BIEM LOFEN'… "B.M. loafen"? euchhh…. As long as we're going for the weird (by which I'm not referring to Czech), the ⟨kk⟩ could represent an ejective [kʼ], or a Korean tense [k͈ ], or a kifish* tense uvular trill. * Encyclopedia of Fictional and Fantastic Languages. Pearson Education, Tim Conley and Stephen Cain. 2006. Pp. 27–28. The ⟨kk⟩ actually represents a sound humans can't pronounce — a rapid chattering of the inner set of kif teeth — but it can be approximated by a voiceless velar trill, which requires tensing of the tongue behind the point of contact. At first glance, it reminds me of BFE which stands for Bum-F*ckin-Egypt and is meant to designate a place which is so far away that no one knows exactly where it is. Urban mythology states that there was / is a place named Bamfaq (or some such spelling) in Egypt which is out there somewhere. Of course, this has nothing to do with a new brand of clothing, but it's what came to my mind. If you're desperate to pronounce "Biemlfdlkk", I suggest going with syllabic l's: Bie-mlf-dlkk. A Czech speaker may be able to help. The first thing I thought of when seeing "LFDLKK" is that these letters are all initials in pinyin. This sort of pinyin acronym seems common in China for things like WiFi network names. For example, a restaurant called 滋味烤鱼 might name its wifi network "zwky2015". So what could it be if at least the latter part of the name are considered initials? 来__来看看? Or perhaps because the pinyin initials of the chinese name 勒芬 are also the first two letters in "LFDLKK", that part is accounted for (however meaningless) and the DLKK portion should be considered together?